...it is the university that institutionalizes a real bias against translated literature. In the most prestigious universities, you study “English,” or else “comparative literature” in the original languages. There are very few opportunities to read translated literature; they are usually in cultural history classes, or else pet projects of professors that wouldn’t attract enough students otherwise. I don’t know if this attitude is present in most other countries, though I know it is England. But to echo Borges, what is lost is often miniscule compared to what is preserved. What you lose, however, is the authority to know exactly what was said, and what’s left is the uncertainty that one turn of phrase may or may not have a hidden resonance, that a language-specific idiom could not possibly communicate the same thing as whatever is in the original. The Quartet Encounters translations made this obvious, which in one sense was helpful. I had to treat them on the level of the abstract ideas, characters, and plots communicated imprecisely, not the specifics of the language. With few exceptions, I was not able to do this at university, and I appreciated the bald awkwardness of many of the translations, which pushed me away from the particulars of the words. -- And since the particular of the words are so important in literary study, translations are ignored. Important, yes: but surely not all important? Why not read more translated books in college-level classes -- not only in particular offerings of various foreign-language departments (classes on Dante or Russian literature and the like), but works from multiple languages, actually integrated with English-language novels? Very sad news: Joanna Russ, one of the great SF writers, died today. ...and then you get it: "Female Man". Right. Of course. -- And, if you're like me, you feel ashamed you didn't get it earlier. It's probably wrong of me, but I take a small piece of consolation in the fact that the parenthesis for number 4 -- where Joanna Russ talks about "my wife" -- now sounds far more natural than it did when the book came out 36 years ago; and that I suspect (or at least hope) that twenty-year-olds who read it 36 years from now won't get why it was supposed to sound odd at all. She's a great writer. As always in such cases, the small sliver of consolation is that her works remain. But it's always hard not to wish that won't be more of them. • The 2006 phone interview with Samuel R. Delany at Wiscon (referenced by Patrick Nielsen Hayden in the above-linked thread). • The opening of her book How to Suppress Women's Writing. If a google search for a book title and author's name (from a fairly full one like Stephen Jay Gould The Hedgehog, the Fox, and the Magister's Pox* to a simple one like Adapting Minds Buller) does not bring up the Google Books page for the volume in question within the top ten results, then there is no preview (or only a basically-useless snippet view) of the book. If there is a preview of the book, however, then the google books page will be in the top ten google results. Known exceptions: if the book is very new, reviews, sales and publisher's pages will sometimes crowd the top ten and crowd out the preview; and if the author's name and title is sufficiently general, then non-relevant hits might crowd out the preview. * And no, Google, I did not mean Ghould instead of Gould. Oi. Even knowing Ashbery's reputation as a postmodernist poet, those last few lines gave me pause. "...his reflection, of which the portrait is the reflection, of which the portrait is the reflection once removed"? Whence that double portrait and treble reflection? That the portrait is the reflection of the reflection makes obvious sense, but what does it then mean to say of that that the portrait is it's reflection once removed? Is it a restatement of the previous lines (i.e. first the poet thinks it's a reflection, then decides that no, it's a reflection once removed), or is it a comment somehow on the nature of reflection, that there is always (in the mind, perhaps?) a double reflection, so that the portrait is a reflection, and that that itself is (self-reflected?) in the portrait at one remove? -- And that, again, makes straightforward sense. 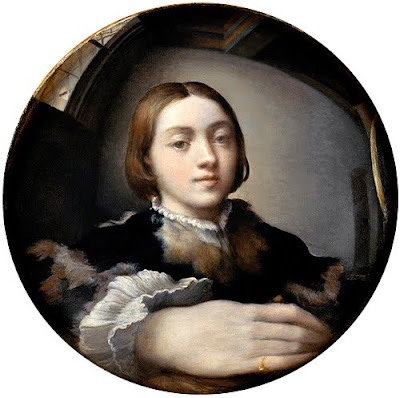 So why do I feel a slight nostalgia, a slight sadness, for those great lines of poetry -- never, apparently, written deliberately -- saying of Parmigianino's Self-Portrait that it portrays "Chiefly his reflection, of which the portrait/Is the reflection, of which the portrait/Is the reflection once removed."? To close off this blog entry, insert your own self-reflective joke about the convex (distorted) nature of the reflection of quotation and description here. Can We Have An Update on the Acutal Work of Art, Please? 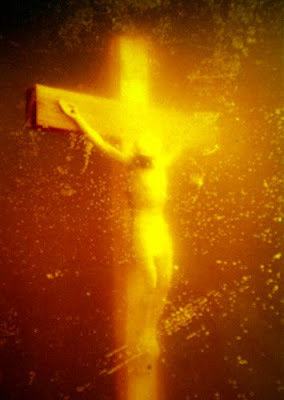 Apparently Andres Serrano's long-controversial photograph Immersion (Piss Christ) has been destroyed (some news reports have "damaged") by fundamentalist Catholic protesters in France. All the various news stories and blog posts I've seen on this (e.g.) have focused on the culture-war angle -- the photograph has always been controversial, the rise of Christian fundamentalism and so forth; P Z Myers (reasonably) compares this to the Taliban's destruction of Buddhist statuses. Etc. But I'm primarily worried about the artwork. Can it be repaired? More importantly: Immersion (Piss Christ) was a photograph, which are often (but not always) made in series -- so that there are a handful of "originals" rather than just a single original, as in the case of a painting. Is this true with Serrano's work? Nothing I've seen so far has addressed this, but I'm actually very eager to find out. Gorgeous. And also, as many people have noted, a very religious image. Serrano himself has said that "I have always felt that my work is religious, not sacrilegious... I am drawn to the symbols of the Church.... I like to believe that rather than destroy icons, I make new ones." A writer for the Guardian makes a similar point here. Even PZ Myers, not known for his sympathy to religious expression, notes that the "luminous golden glow" is "reverential". But mostly it's beautiful. I've only seen reproductions, which never do a work of art justice, and I'd love to see the original someday. Can I? That is, are there other, still-undamaged originals made by Serrano from the same negative? Or was there only one, and it is truly gone? I'd really like to know. Anyone feel like doing (or linking to) any reporting on this angle? Update: Telling this story to a photography buff, he assured me that more than one copy of "Piss Christ" was made (photos are often made in series, usually in the 3-12 range I think). So it does still exist, somewhere. Just don't tell the wackos. * I'm reminded of the line which the late David Foster Wallace quoted from a novel by William H. Gass (which I've not read and know nothing else about), Omensetter's Luck: "The body of Our Saviour shat but Our Saviour shat not." 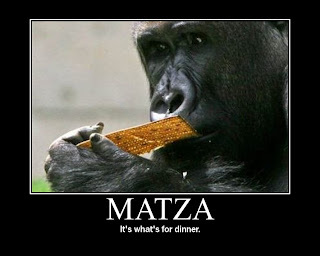 Happy Passover to all those who celebrate it! ...our humanity is our burden, our life; we need not battle for it; we need only do what is infinitely more difficult -- that is, accept it. The failure of the protest novel lies in its rejection of life, the human being, the denial of his beauty, dread, power, in its insistence that it is in his categorization alone which is real and which cannot be transcended. -- James Baldwin, "Everybody's Protest Novel"
When I read about how Obama took a terrible deal and made it far worse by the political equivalent of scoring a goal against his own side (see also, and also) the first thing I thought of was this old post about how Obama's worst failure is that he's bad at loosing. But I didn't even remember where I'd read it. Thankfully, Gerry Canavan linked to the writer of the "bad at loosing" post's recent post about how this particular episode exemplifies the fact that Obama's so very, very bad at loosing. • Obama is Bad at Losing, Budget Edition, from today. For myself, I can't look at the train wreck no more, 'cause the brightness of the light from the burning bodies is starting to hurt my eyes. Hey, just because I'm not going all out and putting up a poem every day like I did in late March, I can still find a poem & post it, right? Sen. Jon Kyl (R-AZ) thinks women should be enslaved and turned into dedicated breeding machines. ...[T]he proponents of competing paradigms practice their trades in different worlds. [...] Practicing in different worlds, the two groups of scientists see different things when they look from the same point in the same direction. Again, that is not to say that they can see anything they please. Both are looking at the world, and what they look at has not changed. But in some areas they see different things, and they see them in different relations one to the other. From "practicing in different worlds" to "both are looking at the world" in the space of two sentences! 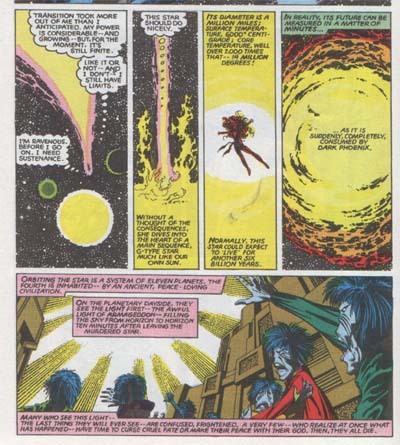 It gives a whole new meaning to the phrase "the destroyer of worlds". Jean Grey, eat your heart out! Twenty years ago today my mother, Mary Joe Frug, was murdered about a block from our house in Cambridge, Massachusetts. It was early evening; she was out for a walk. No one was ever caught or charged; we have no idea, to this day, who killed her. It was less than a month after my twentieth birthday. At some point in the week and a half after she died, my sister and I were sitting in my parents' bedroom, talking, and it suddenly struck me that some day I would be forty, and it would have been half my life. I vividly remember telling my sister this, literally days after our mother's death. (I don't think she remembers.) I've remembered it a long time. And now, today, I am forty, and it's been twenty years. Half my life. For the actual burial, we had a private funeral service for my mother Monday morning, April 8 -- mostly just family, with one or two friends brought along for support. Then, that afternoon there was a memorial service in Harvard's Memorial Church. (When she died my mother, on leave from her regular job at New England School of Law in Boston, was a scholar at Radcliffe's Bunting Institute; my father taught (and teaches) at Harvard, and I was then a sophomore in college there.) It's a big church; and it was filled. I think there were more than a thousand people there. And there were eight speakers. Five were friends of our family's, including of course my mom: Cynthia Wardell, Mopsy Strange Kennedy, Judi Greenberg, Le Clanché du Rand, David Kennedy. There was the Dean of my mom's law school, New England, John O'Brien; there was a colleague of my mom's (whom I'd never met before or, to my recollection, since) Marie Ashe. (That's all in order, except that John O'Brien spoke second, between Cynthia and Mopsy.) And then, lastly, there was me. The year after her death, the New England Law Review published a special two-volume issue dedicated to my mom's memory. It had to be two volumes because so many of her friends (mostly other law professors) wanted to submit an article. As a sort of preface, they printed the entire memorial service -- Rabbi Finestone's opening and closing benedictions, and all eight speeches. If you want to read it, the citation for it is 26 New England Law Review iii, pp. 636-658. (Yes, I had to look that up). I think that, all things considered, it gives a pretty good sense of what she was like. Here's what I said. I wrote it the night before, a few days after my mom's murder. I was twenty. It's got a few things in it that embarrass me now -- infelicities of diverse sorts. But I haven't changed it. I’m here to speak about my mom. I’m the only person I know who heard the phrase, “carpe diem”, before they saw the movie that made it so common. I knew it from my mom. She used to tell me that, often. “Seize the Day” she would say. This would be her advice when I was down, depressed about something I had done or something I could not do. And she would follow her own advice, seizing every day that I knew her. I’d like to tell you some things she did. They’re not really important things, they’re everyday things, things she sized. One of the things about my mom is that she did everything with gusto. Here are some things that she did. She would play any tape that she liked over and over and over again, until she got sick of it and couldn’t listen to it for a month. She would wait until beyond the last possible moment to do anything, and then do it when everyone thought that she couldn’t. She would wait up for me or Emily to get home, and talk to us when we got back. She ate the icing off of cake and left the cake. She said that the reason she did this was that her father once stole her icing when she wasn’t looking. I think she just didn’t like cake. She would manage to get to know perfect strangers before I could learn their name. People at grocery stores, friends of mine or my sisters, random strangers at a cocktail party: she would be busy “chatting them up” as she used to call it, finding out more about their soul then I would have thought possible. She was better with people then anyone else I know. She would put on makeup before driving me somewhere at two in the morning when no one could see her. She would read every night before she went to bed. She read everything and anything. I can’t think of anyone who had as broad a taste as she did. There was always something called, “My Novel” which would change every few days. She was the first in Latin in the state of Ohio when she was in high school. I guess that’s where she learned the words “Carpe Diem”. I don’t know why, but she mentioned that fact a lot. My mother could be very funny. A few weeks before she died, I talked to her about her trip to the Caribbean with my sister. “Well, you feel like a load of laundry: there’s a rinse cycle then a dry cycle and then you start again”, she said. She would do embarrassing things in restaurants. She would bend over to people eating next to us and ask what they had for dinner, and if they liked it. My family, we would all cringe and blush. She was never embarrassed at all. And she would take walks. Long walks, short walks, bicycle rides, walks during the day, walks at night. And that is how she died. I want to say one thing about today. On behalf of my family, I want to thank you all for coming. A lot of you, if not all of you, feel that you have some special relationship to Mary Joe. All of you are right. The way she was is such that she had a special relationship with more people than I can count. And she cared about every one. Every one. As you’ve heard already, and as all of you know, my mother passed into that other world in the full grip of many passions. When I was trying to think about what to say, and what to do, I was trying to think what she would want us to do. I thought back to what she said when her father died, years ago. She was sad, she felt his loss. She felt that she wished she had talked to him more, that she had done this and that-- as you all no doubt feel now. And then she kept going. She kept being strong, she kept being joyful, she kept being full of cheer. She kept being Mary Joe Frug. There were imperfections in my mother’s life, like in all of ours. But she never spent much time regretting them. Rest in peace, Mom. I miss you. Russell Kirk is best known as one of the intellectual founders of modern American conservatism; his best known work is The Conservative Mind, and it was one of the thirteen books I chose to assign in my survey of U. S. Intellectual History Since 1865 (we just had our discussion of it yesterday). It was far from his only contribution to this tradition, however: he also wrote a column in the National Review in its early years, edited his own conservative journal called Modern Age, and wrote a lot of other books on conservative thought, and so forth. Like William F. Buckley and Barry Goldwater, Kirk is one of the intellectual founders of contemporary American politics, of enormous influence. But Russell Kirk was also a fantasy writer, specializing in ghost stories; reviewer Michael Dirda, who knows whereof he speaks, called Kirk "the greatest American author of ghostly tales in the classic style". And, as I found out when preparing my lectures for this week, his story "There's a Long, Long Trail A-Winding" actually won the World Fantasy Award in 1977 for best short story (the same year Ray Bradbury got a lifetime achievement award). It's included in a collection of Kirk's short fiction called Ancestral Shadows, and also in David Hartwell's anthology The Dark Descent (which I've owned for years, and have read a lot, but not all, of -- and not this story, nor did the identity of its author ever penetrate my consciousness; this shouldn't have been a surprise to me -- but it was). I'm fairly certain he's the only author we're reading this semester who won a major F/SF award. I wouldn't be surprised if he's the only person I'm so much as mentioning in the class who ever won a major F/SF award. So after noting that this past February was my second-highest posting month ever, it turns out that i put up even more posts this March (it was, in fact, my single heaviest posting-month ever). It's not quite the same as last month, though, since most were just me reprinting poems -- upon finding that I had (quite coincidentally -- some of them were even pre-scheduled some time before March) put up seven poems, I declared it Accidental Poetry Month™ and (deliberately) put up more than a dozen more. A poem called "Midas" that I myself wrote which I published (for the first time ever) on this blog yesterday. If you were going to read just two of my posts from this month, those are the ones I'd suggest (even, push). Apart from that, however, here are the poems I put up on this blog. An asterisk indicates that the post in question has a significant amount of material (a judgment call, obviously) in addition to the text of the poem -- not always about the poem itself, and in at least one cast only tangentially related at best. In the other cases, the post is basically just the poem, with at most a paragraph or two clarifying some reference or the like. So you can go especially to, or avoid, either kind as you prefer. Barnstone, Willis, "The Secret Reader"
Cope, Wendy, "Waste Land Limericks"
Eliot, George, "God Needs Antonio"
Heaney, Seamus, "Requiem for the Croppies"
--- "Powers of Thirteen: 29"
---, "The Death of the Ball Turret Gunner"
Sidgwick, Frank, "The Aeronaut to His Lady"
Wilbur, Richard, "Advice to a Prophet"
A rather eclectic little anthology, to be sure. But all poems worth reading, which is enough. And as I said before: don't be surprised if things quiet down around here: these things go in cycles, and I've been running hot awhile. On the other hand, I said that last month too, so I suppose you shouldn't be surprised if the opposite happens, either.